There has been enormous growth in the fields of coaching, mentoring, and consultancy in the last decade. Stories, diagrams, and models along with self-assessment exercises equip readers with techniques on how to impact those they are coaching or supervising. These professions, like psychotherapy and counselling before them, are going through a phase of professionalisation, with the establishment of formal standards, European bodies and standard requirements for supervision. This book provides a response to these growing demands. Divided into three parts, the book first discusses the practice of coaching, mentoring and consultancy. The second section then goes on to look at development and supervision of these roles whilst the third addresses the wider issues of training, skills and capacities required in these roles. As a coaching supervisor, I found this book, an update from the 2006 version, extremely useful. The references are current and the thinking refreshed and refreshing. I particularly liked the chapters on supervision and the exploration of ethics in the skills and capacities third section. It challenged my practice and cause me to reflect on what else I might do to support the learning and development of the coaches I work with. The preface drew the reader in to share the authors' experience and set the questions racing. The update includes in-company developments, systemic team coaching, more examination of a coaching culture and leadership styles and includes important new material. 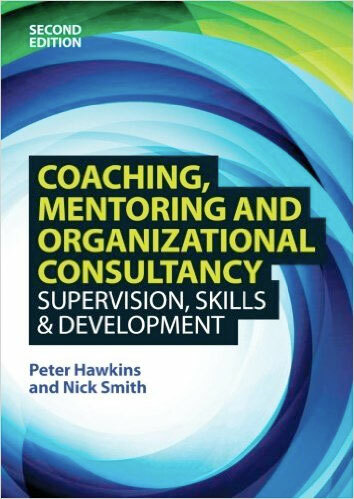 There is also a helpful section on working with difference and the cross cultural aspects of consultancy and coaching. Well worth the reading for any professional mentor, coach, supervisor or developer of leaders and organisations. “The whole spirit of the book is one that acknowledges and values human strengths and frailties. It is a spirit which also values rigour in aspiring to the best possible practice. It asks (and inspires) those of us in a position to do so, to play a part in promoting working cultures where learning and development are prized. Peter Hawkins and Robin Shohet have written a book on supervision that is not just 'good enough' (Winnicott) it is a gem. At its heart, this book contains readable, inspiring material on the process of individual supervision that will be readily appreciated by new and not so new supervisors. With its comprehensive, engaging and thoughtful approach, this is now the main recommended text on my supervision courses. I highly commend the book. The authors of this book really do know their subject well and have organised the presentation in a clear, systematic, readable style, refreshingly devoid of transatlantic jargon. It deals with all aspects of supervision and most importantly provides a meaningful blueprint about how useful and effective supervision can be. Let me recommend this book to you without reservation.